In Western world there are 4 season. But, in Nepal there are 6 seasons. Two additional seasons in Nepal are Rainy Season and Pre-winter Season. Nepali seasons are 2-months long. Basanta Ritu, spring season in Nepali, spans into two months – Chaitra and Baisakh (mid-March to mid-May). Right after the winter (Shishir Ritu) new buds grown in trees and flowers bloom in this season. The temperature is just right – not too cold and not too hot. This season is windy season. One of the most attractive aspect of the season is blooming of Laliguras, the National Flower of Nepal. 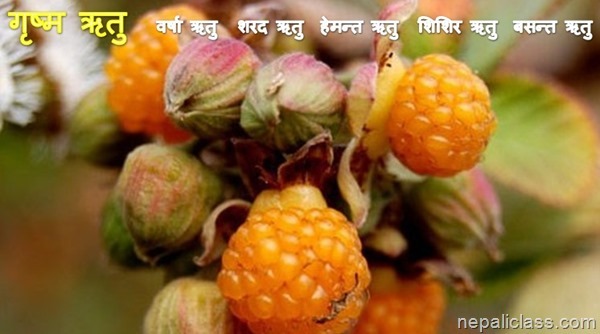 Grishma Ritu, Summer season in Nepal, spans into Jestha and Aashad (mid-May to mid-July). This is the hottest season of all. The flowers fall down and fruits grow in trees. For agriculture, this is the best season to grow crop. Farmers plant paddy and other summer crops in the season. Some of the most attractive aspect of this season are eating summer fruits like mangoes and wild berries. Barsha Ritu, Rainy season in Nepal, starts in Shrawan and ends in Bhadra (mid-July to mid-September). At this season, extensive rainy days are observed. The rain provide irrigation to agricultural crops and recharge ground water. Some roads can get muddy and travelling at this time are messy. One of the most attractive aspect of this season is paddy plantation. Paddy plantation starts at the end of Grishma Ritu and continues in Barsha Ritu. The farmers make the working in field fun by singing dancing and playing with mud. Sharad Ritu, Autumn season in Nepal, starts in Ashwin and ends in Kartik (mid-September to mid-November). This season is the season of festivals. By this time, the farmers have already completed their plantation and are waiting to harvest crop in the next season. The temperature goes down in this season and it is just right for the celebration. Some of the most attractive aspect of this season are various festival. The biggest festivals like Teej, Dashain and Tihar are the main attraction of the season. Hemanta Ritu, pre-Winter season in Nepal, starts in Mangsir and ends in Poush (mid-November to mid-January). This season is the season of working again. The crop harvesting is done in Hemanta. After fun-filled Sharad Ritu, farmers busy themselves in agriculture fields. The temperature starts to fall down and people prepare themselves for the winter. Although major festivals are finished by this season, small celebrations related to the chores of the season are celebrated. 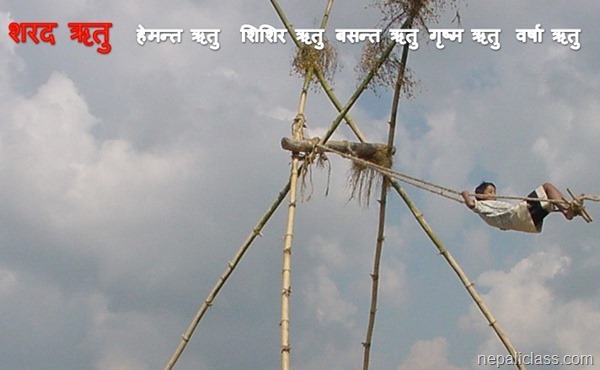 Shishir Ritu, Winter season in Nepal, starts in Magh and ends in Falgun (mid-January to mid-March). This season is the coldest season in the year. Cold season starts at the end of Hemanta and ends by the end of Shishir. Snow falls in area of high altitude, low-lying areas experience cold waves. Thank you Ranjana for pointing out the mistake. this is really helpful information for the tourism! Thank you for helpful information! Thank you it is very nice and helpful. Please respond to this comment. Shishir Ritu (Winter) from Mid January to Mid April would mean that Chaitra and Baishakh are the month of (post) Winter? Aren’t Chaitra and Baisakh too hot for winter? If you accept that Ranjana’s remark is correct, why haven’t the correction taken place yet? In Nepal, it is pretty cold in Poush (mid-Hemant) and spans till the end of Falgun (Fagu Purnima or Holi).